Would you believe that the round mirror hanging above my Industrial Bar Cabinet that I shared with you the other day used to be maroon? I’ve never been a fan of maroon. I don’t even like the sound of the word maroon. (You know you just said it out loud. It sounds yucky huh?) Anyway, I got the mirror from my grandmother’s home and it was another item that was sitting in my garage for awhile and needed some love. So that is what I gave it. Love in the form of some paint and a metallic herringbone pattern that was super easy! 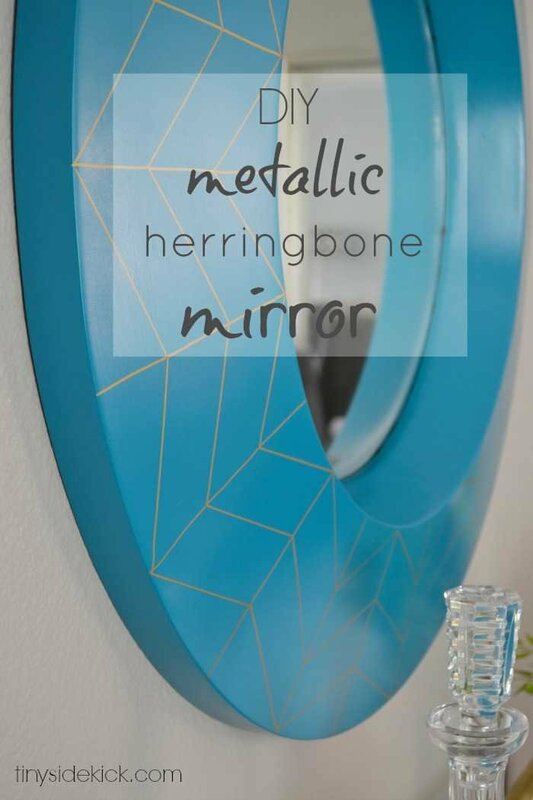 So readers, meet my metallic herringbone mirror. By the way I drew those lines for the herringbone pattern, and came up with a really easy way to get them straight and even on this round and uneven surface. If I do say so myself my techniques is pure genius. Keep reading and you will see. It is really quite awesome what can happen when you do everything in your power to avoid math. See that maroon color. Not cool. Let’s get to how I spruced it up! The first thing I did was tape off the mirror part and give it a light sanding. It had a few blemishes that I was able to get less noticeable with some sanding. Then I gave it a coat of primer, let it dry, and then spray painted two coats of my go to blue color (Lagoon by Rust-Oleum.) You probably recognize it from my diy outdoor curtains and my spray painted plastic outdoor furniture. By the way, this frame is made out of metal, it isn’t wood. If it were wood I would have sanded more and probably skipped the primer. The primer will help the paint stick to the metal. Like I mentioned, I do everything in my power to avoid math. Math and I are not friends. We never have been, and never will be and I find that in my quest to avoid doing any math, I end up coming up with some pretty clever ways of getting things done. Let me explain this weird way of getting the herringbone pattern. 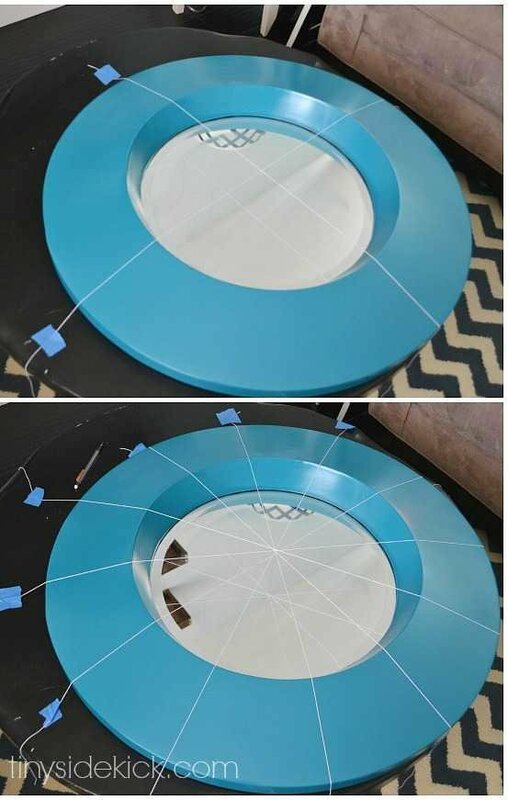 I laid my mirror flat on a table and divided it in half and then in half again using string. Then I added two more pieces of string to divide each quarter into 3 equal parts. I secured the string with tape to the table, which made it really easy to move until everything looked even. Then, using a gold metallic sharpie paint pen, I used the string to guide my lines. I just sorta went for it free hand using the string as a guide. When I was done, I took the string off. Then I took a piece of cardboard the same length as my lines and marked it every 1/3 and used it to make 3 tiny marks on each line. I used the same piece of cardboard to draw the diagonal lines making them go the opposite direction each time to create the herringbone pattern. It is important to not trace directly against the piece of cardboard when you do this because the paint will get under the cardboard and smudge. Instead, place your cardboard and use it as a guide, making your mark just slightly away from it. I love the pop of color it adds just above my new bar cabinet and the gold is just the perfect detail to tie the two pieces together. So, are you ready to add some herringbone to something? Love the mirror! And I also love your new bar cabinet where did you get it? Thanks, Jennifer! The bar cabinet was upcycled from an old cabinet my grandmother had. You can see the cabinet transformation here! 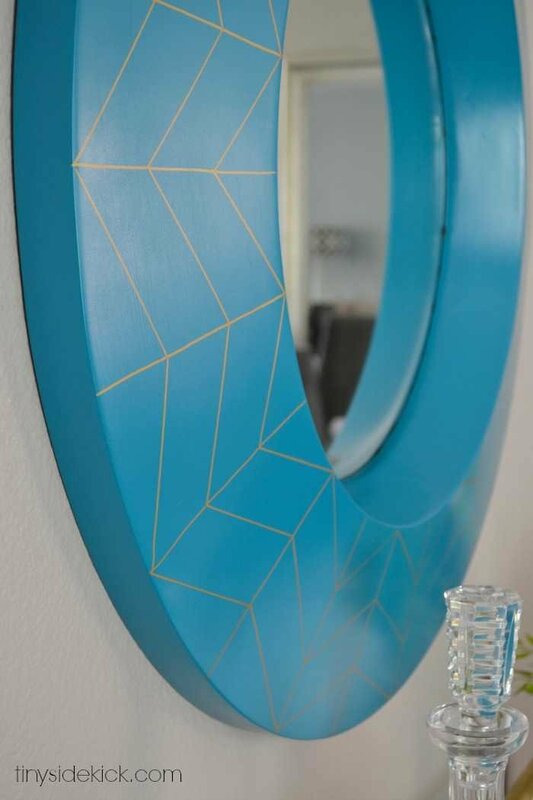 You have such a knack with creating lovely geometric decor! Great job and I love how you mixed the metallics so nicely. Thank you so much! That means a lot coming from you 🙂 Made my day. Wow, I love the blue mirror, great idea! I can’t wait to try it, so beautiful! I love this mirror! Great job. Pinning! The power of math is not my friend either, Pretty impressed that you used math for this project. What an amazing transformation, love the whole look. Oh wow this looks so cute. Love the Gold detail. Love it! I can’t believe you did that with a sharpie. It looks great! Yay!! I just knew that mirror was an upcoming DIY post, love it. And goodness, GREAT idea to use string to layout the line work. Pinning this beauty. That turned out SO awesome Corey!! I love your creative way to do the herringbone, math and I totally don’t agree either. 🙂 love the color you chose!! Thank you Amanda. The hubs always tells me that it would take less time to do the math. He must not know me and math! hahaha. Thanks so much for stopping by. Have a fantastic week. I avoid math at all costs too! 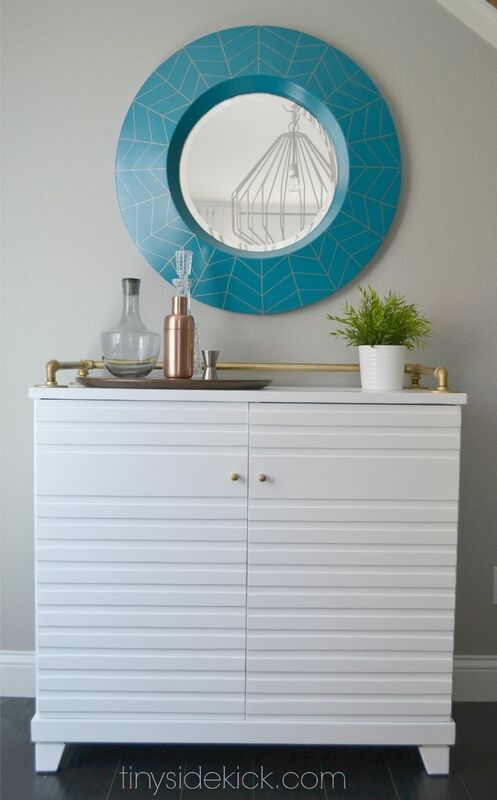 Love the mirror, especially the gold herringbone pattern! I’d love for you to share this project at my Show-Licious Craft & Recipe Party! Hey Ashley! I’m adding your party to my list this week! Thanks so much for coming by! I’m a huge fan of herringbone right now. In fact, the last project I shared on my blog was a herringbone painting. The way you avoided doing math (which I also dislike) is brilliant and your end results are fantastic.